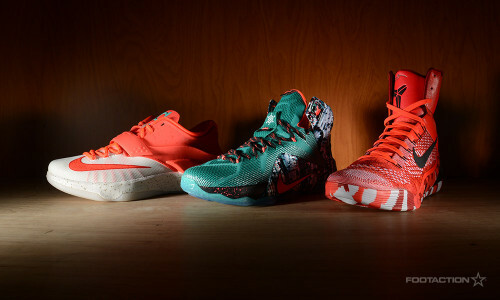 Nike Basketball’s signature athletes Kobe Bryant, Kevin Durant and LeBron James are celebrating Christmas by releasing festive kicks to tell their individual stories. The Kobe 9 highlights its knitted aesthetic with a red and white Flyknit upper, taking inspiration from a knit stocking. Leather textures on the tongue and overlays give the shoe a premium feel, while its marbled outsole resembles candy canes. The KD7 pays tribute to his favorite holiday beverage, eggnog. A red Hyperposite heel integrates glossy flecks emulating the condensation on a glass of eggnog. Last but not least, the LeBron 12 combines the shoe’s photorealistic camouflage upper on the Hyperposite shell. The camo pattern is inspired by Akron, Ohio’s winter weather and includes a birch tree pattern. Black and Hyperpunch micro dots integrate into the camo pattern for a seasonal touch. Available in stores and online Friday, December 26. Check out Release Locator for stores. Print article This entry was posted by hhcblog on December 19, 2014 at 6:34 pm, and is filed under Footwear. Follow any responses to this post through RSS 2.0. You can leave a response or trackback from your own site.